Yes, Xandros was horrible. But this ubuntu thing is working out nicely! As I said before, the bastardized Xandros  sucked. In fact, I managed to destroy it. So I decided to switch to another distro. Any distro. Enter eeeXubuntu, a eee-tuned Xubuntu . 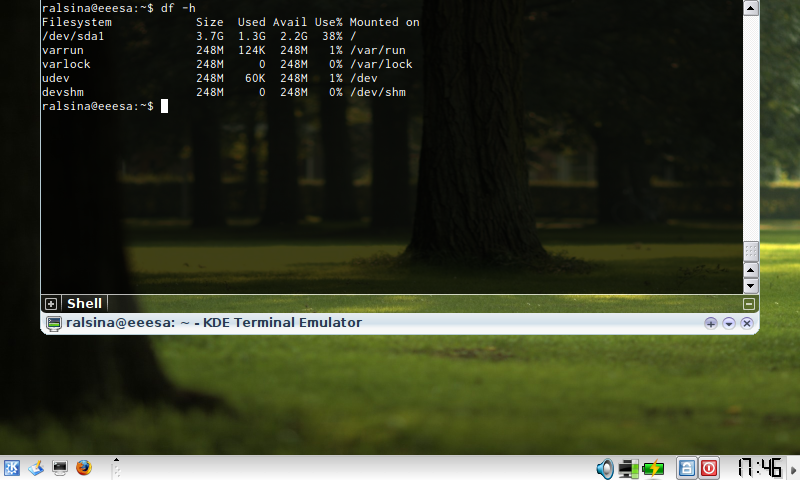 Since I prefer KDE to XFCE, I started hacking at it, and produced, IMVHO, a much nicer thing. As you can see, it takes slightly less space than eeeXubuntu's default, and a whooping 1GB less than the default distro. How did I do it? First, by deciding what I wanted. No printing. I have not used a printer in 5 years. What are the odds I will use one from the eee? wicd for network configuration. It works for wireless/wired/encrypted and has no problem whatsoever reconnecting after suspend. yakuake for terminal. It uses the least screen-space possible: none if you are not using it. It works great, boots in 35 seconds (and I have not tuned that, yet). Maybe someone more enterprising will make a real distro out of it. Which is itself a bastardized Debian etch.